Everton midfielder Fara Williams hit a hat-trick as England opened their 2011 World Cup qualifying campaign with an easy victory over poor opposition. A sharper England could have matched the 13-0 scoreline inflicted on Malta by Spain in their opening qualifier. But what was virtually a second string line-up rarely impressed despite the sending off of Malta's Natasha Pace. National Coach Hope Powell said: "We scored eight but it should have been 20, so that's disappointing." 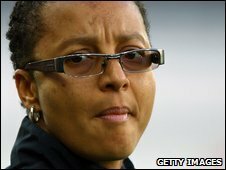 England made seven changes from the side that lost 6-2 to Germany in last month's Euro 2009 final and, despite amassing a large scoreline at Blackpool's Bloomfield Road, Powell was reserved in her praise. "We created lots of chances, but there was a lack of quality in front of goal," she said. "The most important thing was the three points though, and we gave several players the chance of gaining more international experience and that was important too." Against opponents ranked 81 places below themselves at 89th in the world, Powell's team hit four goals in each half. Captain Faye White got the first after just eight minutes and Williams opened her account 12 minutes later. After Jess Clarke had scored in the 37th minute, the Everton skipper got her second six minutes before the break. She then completed her hat-trick eight minutes after Maltese central defender Pace had seen red for a second bookable offence in the 57th minute. Leeds Carnegie winger Clarke struck again in the 76th minute and 60 seconds later substitute Emily Westwood put her name on the scoresheet. Westwood's Everton colleague Rachel Unitt rounded off the scoring three minutes from time. England (4-2-3-1): Bardsley (New Jersey Sky Blue); A. Scott (Boston Breakers), F White (Arsenal) (Johnson (Everton) 59), Bassett (Leeds Carnegie), Unitt (Everton); J. Scott (Everton), Buet (Chelsea); Clarke (Leeds Carnegie), Williams (Everton) (Westwood (Everton 63), Smith (Leeds Carnegie); Sanderson (Chelsea) (Handley (Everton) 54). Substitutes not used: Brown (Everton), Chapman (Arsenal), Stoney (Chelsea), Aluko (St Louis Athletica). Malta (5-4-1): Costantino; Chircop (Saliba 64), Parnis, Pace, Dagostino, Zammit; Camilleri (Deguara 51), Cuschieri, Theuma, Debono (Fenech 85); Carabott. Substitutes not used: Zahra, C. White, Azzopardi, Xuerreb.